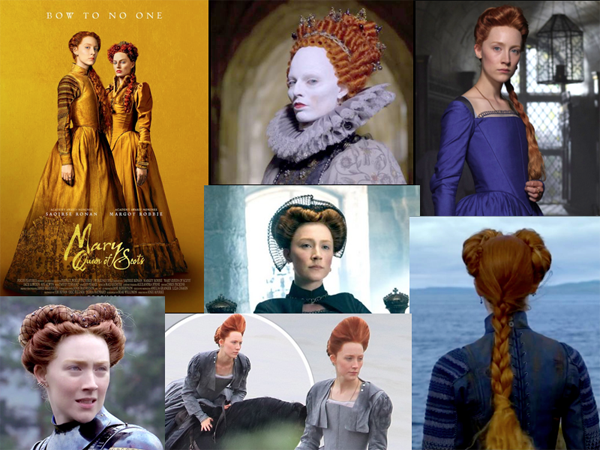 Posts Tagged "16th Century Hair"
Home » Posts Tagged "16th Century Hair"
Thanks to Bryan Bantree, saw a Preview of the 16th Century historical drama movie, Mary Queen of Scots, last night starring Saoirse Ronan as Mary Stuart and Margot Robbie as Queen Elizabeth. The hair was inspirational in almost every scene, with red as the dominant hair color for both Queens. The Cousins, who never actually met, both wore jewels in their hair, which was mostly dressed or wigged in elaborate styles, from beginning to end, not all shown here. The Scottish men were groomed to look ungroomed , the most interesting being Mary’s half brother, James, played by Andrew Rothney. There were 29 hair and makeup artists for the stars and the crowd scenes listed in the credits, with Jenny Shircore listed as the Makeup Hair and Makeup Designer. The movie is worth seeing for the hair styles alone!